Larry Chiang knows how to leverage mentorship. 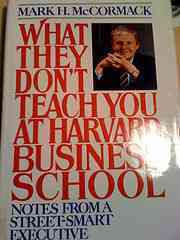 Recently, Harvard Business School featured him in an article controversially titled, “What They Don’t Teach You At Stanford Business School“. If you liked “How to Get Yourself Into a Video Game” and “The Art of Being a Booth Babe“, you’ll love this post: “B-School is Not a Safety Net to Entrepreneurship”. 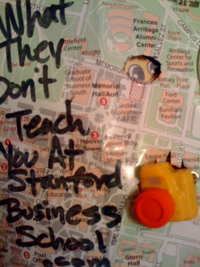 Stanford, California — April 6 — I write about business school and entrepreneurship. Although, I have never submitted an application to b-school, I have been admitted (if you count oral invitations to attend). Because I stand at the critical intersection of b-school and entrepreneurship, I have a genius nugget of knowledge to share: biz school and entrepreneurship mixed incorrectly will absolutely wreck your career. If you’re committed, talented and pedigreed, you will STILL probably fail. Water the commitment down, sprinkle in some distraction and douse it with a “safety net” insurance policy in the form of b-school admittance, and you are walking away with zero. -2- Commit With a Treasure Map. Columbus burned the ships when he landed in the new world. Are you a pirate or a puddy? 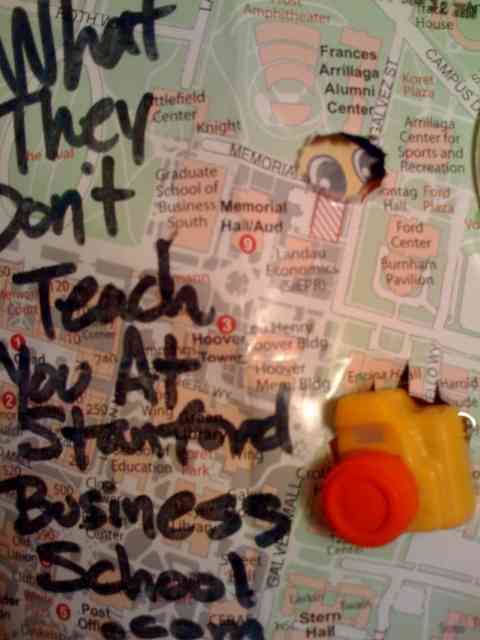 I cut and pasted a treasure map from Dave McClure. Exercise: write down one thing it affects you to do or try. Now, biatch. Now. Have you ever dated a stripper. Its not good. B-School is the same way. We want to be near it to look scandalous and irreverant, but when push comes to shove it is NOT a safety net. In fact, a VC buddy of mine will only invest in dudes with Asian wives with tier one educational pedigree. His rationale is this… Said entrepreneur can (a) can integrate into a new Jappie culture, (b) has a stable home life. Neither can be accomplished if she is working for Abe Lincolns on a pole. Use B-school as a springboard. It’s ok to go with the express written goal of starting a biz with two new classmates. But. And here is a big ‘but’… make sure you avoid working with “one of the 12 b-schoolers you don’t wanna meet”. Yeah its a genius post. Omg, I wrote it. Redaction is a fancy term for quitting b-school. You can call it redaction if its Harvard, Stanford or University of Illinois Law Program. If you went to Duke Fuqua, they call it dropping out. There is a VC I know who happily invests in teams of quitters. If you’ve quit b-school after you’ve gotten in, he will be on your entrepreneur jock. There are some billionaire redacters.. Bill gates, Larry Ellison, Mark Zuckerberg. And me. Oh wait, I graduated Dean’s List from engineering…Darn it. But I’m still gonna be a billionaire. Larry Chiang is the founder of “Deep Underground Credit Knowledge 9″: Duck9. He is trying to get mentored by Tyrese Gibson in how to be a celebrity. He has a book coming out called, “What They Don’t Teach You at Business School“. For fun, Larry reads, models and plays basketball. Text or call him during office hours 11:11am or 11:11pm PST +/-11 minutes at 650-283-8008.